OK ok... I made it... but it's cute, right ? I use a rectangle of burlap fabric, sewed with a jute cord along the edges (Canvas Corp). I glued resist alphas misted with Barn Red glimmer mist, both by Tattered Angels, on the front the bag with fabri-Tac. A piece of ribbon and a small tag (from the Jolly Christmas Saying paper by Canvas Corp) attached with a mini black clothespin finished the project. It's just the right size to slip a gift card into it, so I can count it for my 22th gift card holder ! What a cute little burlap bag and you're right about it being the perfect gift card holder! Thanks for all the great inspiration! What a clever idea. I love it. Thank you for sharing, I would have never thought of that, but it is practically perfect! 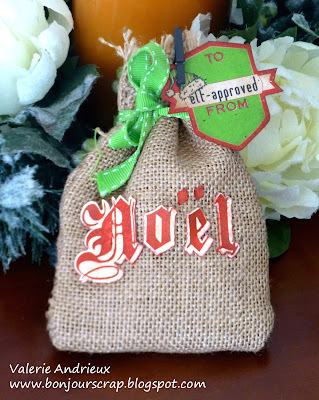 Love burlap and such a great idea!! You are my inspiration!! Keep them coming because you are helping me get all my Christmas gift card holders done!! I've just received some burlap leftovers from a friend's birthday party and didn't know what to do with those pieces. You've given me a very good idea. Thanks.